Note: This feature is not yet live. 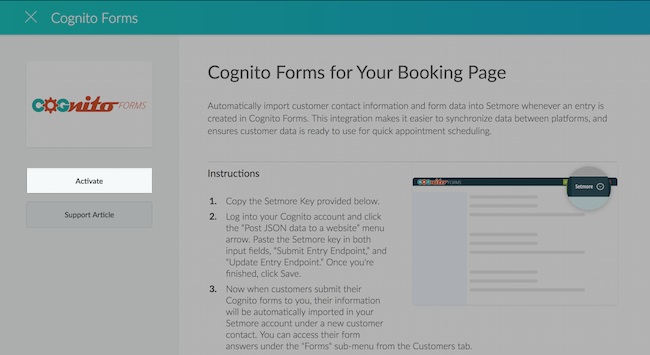 The Cognito Forms integration is coming soon! 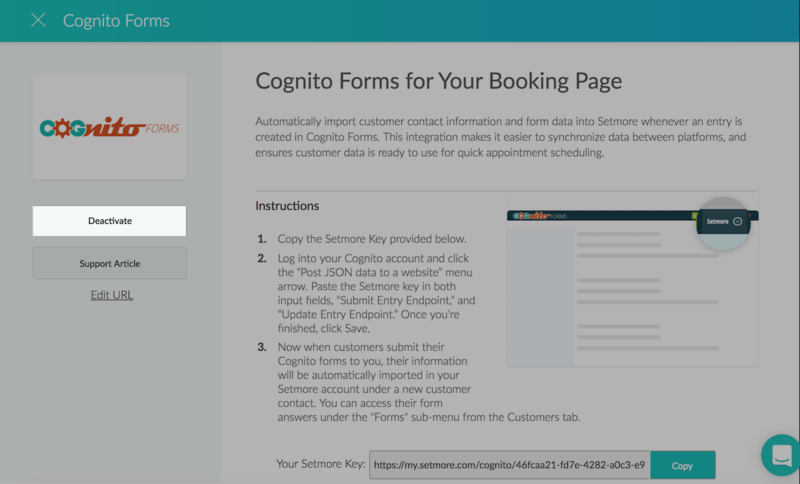 Cognito Forms is a form building software that empowers users to create forms from scratch or from predefined templates. These forms can be used to collect responses from potential leads and website visitors. 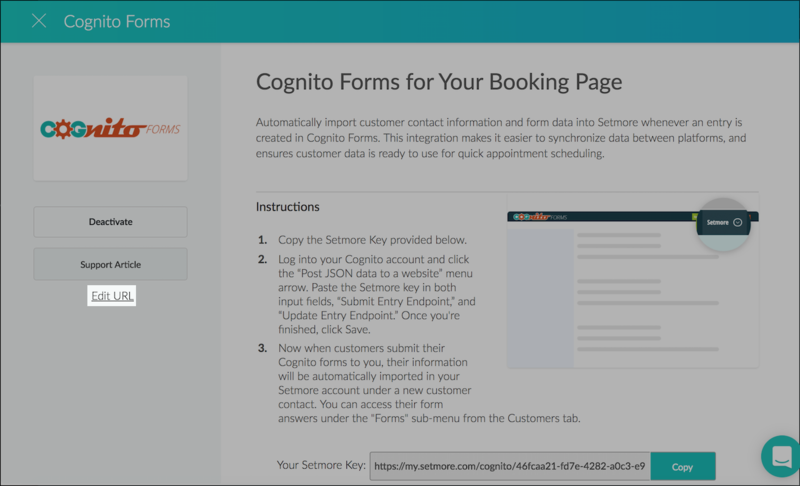 The Setmore-Cognito integration automatically creates customer contacts in your Setmore account based on user responses submitted to your Cognito form. 1. 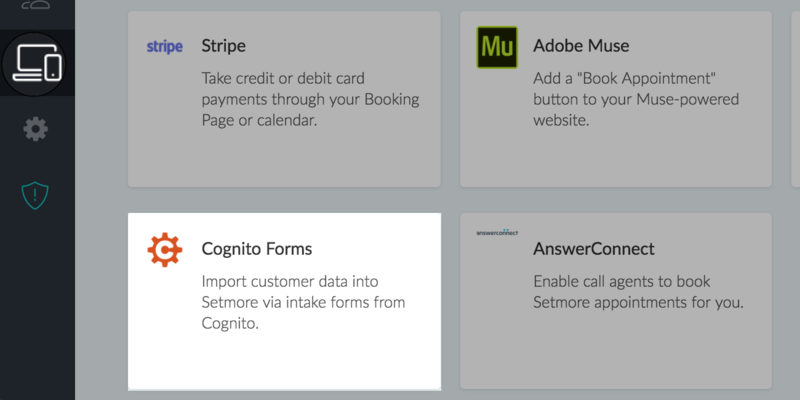 From inside your Setmore account, click Apps & Integrations, then scroll down and choose Cognito Forms. 2. 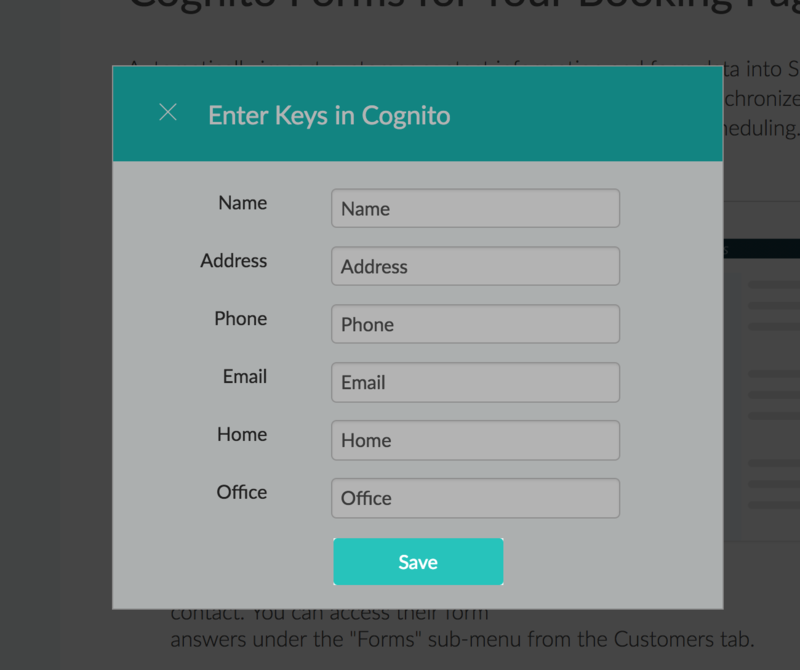 In the Cognito Forms details window, click the Activate button on the left. 3. In the Field Mapping window, match the Setmore fields to the field names used in your Cognito Form and click the Save button. 4. Once activated, a text field with an auto-generated URL will appear. Click the Copy button to copy the URL. 5. 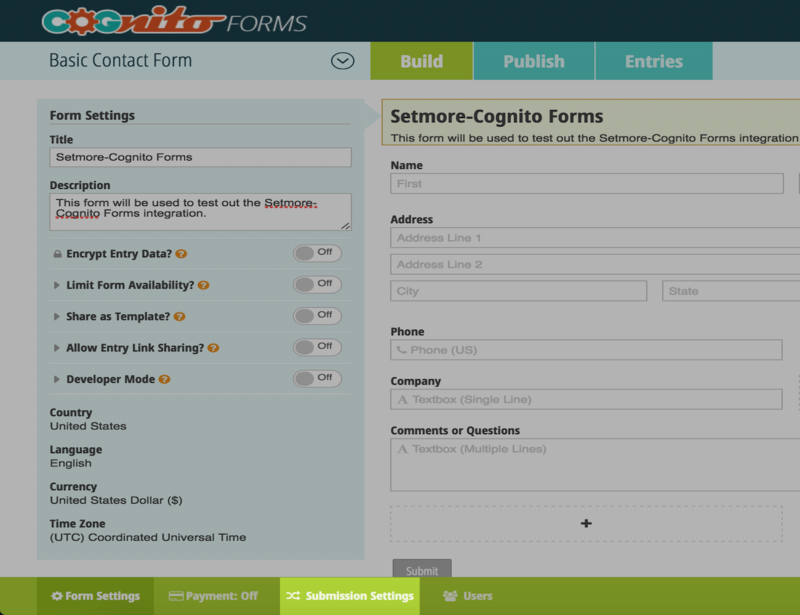 Log in to your Cognito Forms account and click on the form that you want to integrate with Setmore. 6. Choose Submission Settings in the lower tab. 7. 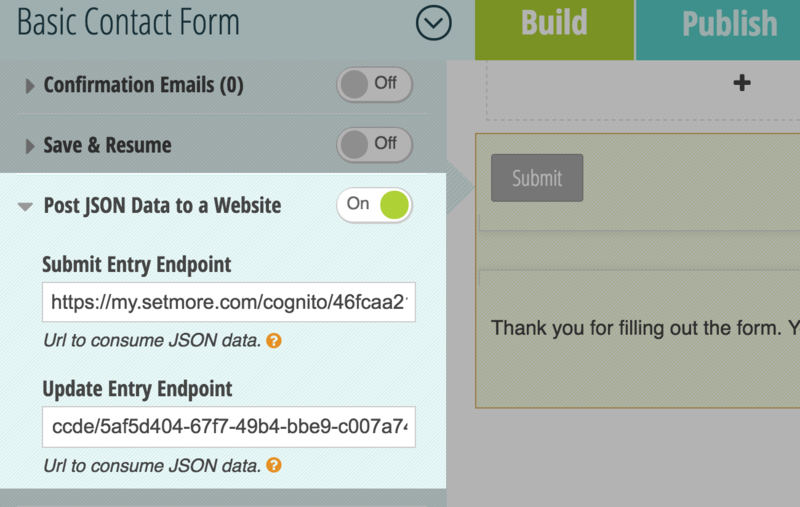 Under the Post JSON Data to a Website, paste the copied URL for both the Submit Entry Endpoint and the Update Entry Endpoint fields. 8. Click the Save button to complete the integration. Now when customers submit a form to you, their information will automatically import to your Setmore account as a new customer contact. 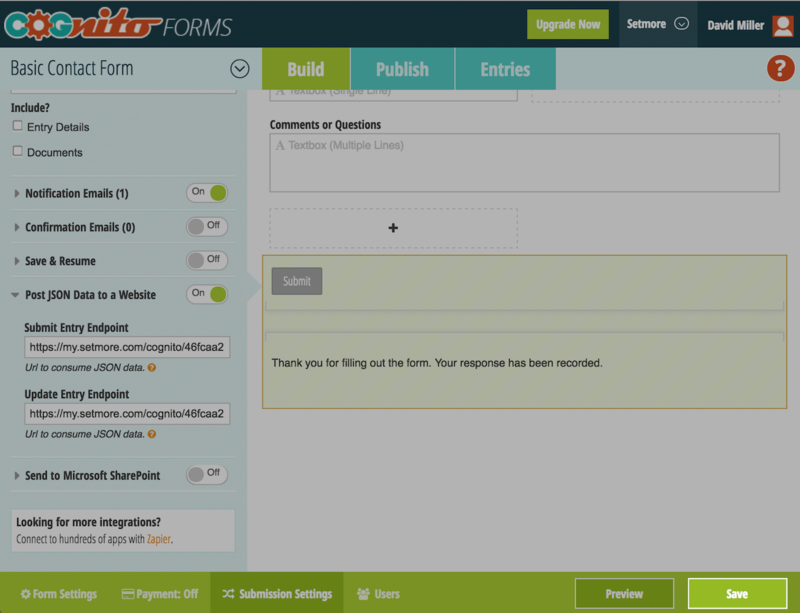 You can access their form answers under the "Forms" sub-menu from the Customers tab. To change the mapping keys, click the Edit URL button and update the mapping conditions. Click Save once you’re finished. A new URL will be generated and you will have to update the URL in Cognito Forms per steps 5-7 above for the integration to work. To deactivate the integration, go to Apps & Integrations > Cognito Forms and click the Deactivate button.